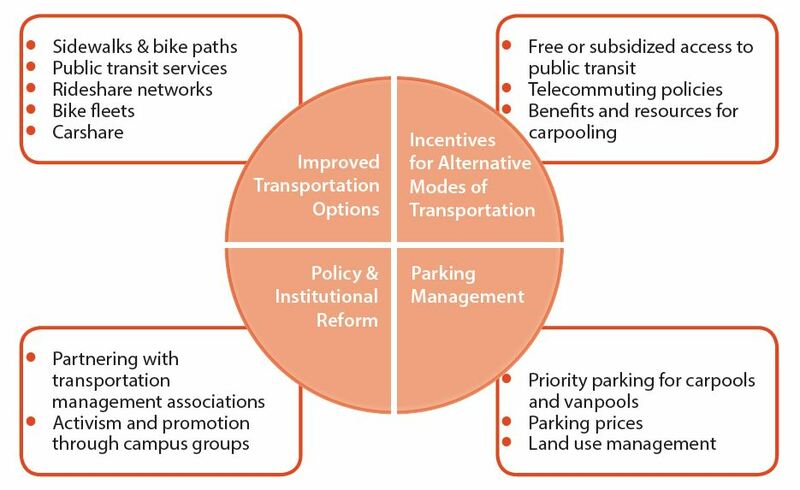 An overview of VMT reduction methods with sectors of implementation featured in VTCCC’s Sustainable Campus Transportation Toolkit. Reducing the number of VMT decreases petroleum use in transportation and reduces vehicle emissions. Also known as transportation demand management, VMT reduction strategies also can reduce traffic congestion, increase vehicle fuel economy, reduce transportation costs, and save time for drivers. On-road vehicles account for more than 80% of all transportation energy use. Transportation planners and corporate decision makers can implement combinations of these strategies to improve fleet and consumer fuel efficiency by targeting the transportation system as a whole. Click on each link below to learn more. Ridesharing: Learn about supporting rideshare and carshare programs to help employees conserve fuel. Mass Transit: Discover ways to encourage employees to conserve fuel by using mass transit. Active Transit: Find ways for employers to encourage conserving fuel through active transit like biking and walking. Multi-Modal Transportation: Explore ways to use multiple modes of transportation to conserve fuel and reduce vehicle miles traveled. Telework: Find out how fleet managers and corporate decision makers can help employees telework to conserve fuel. Providing telecommuting options to employees has become a popular practice across the US. The below recording is from a brown bag offered on 4/3/15 that featured a panel of three Vermont businesses that are implementing progressive telecommuting policies that expand employee flexibility, reduce environmental impacts of driving, and lower consumption of petroleum. Tim Shea, Associate Vice President of Facilities, Purchasing & Contracting at National Life Group, Jennifer Chiodo, Managing Principal at Cx Associates, Erika Schramm Director of Administrative Services at Vermont Energy Investment Corporation highlight policies and programs that support telecommuting or working remotely, methods to measure and track value behind this practice, and strategies for improving their program, and recommendations to other employers seeking to incorporate telecommuting into their tool box of practices at their respective workplaces.